Uni the Unicorn (Library Binding) | Let's Play Books! Uni is just like all the other unicorns . . . except for one thing: she believes that little girls are REAL. 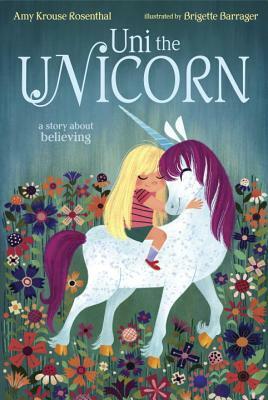 This magical story by Amy Krouse Rosenthal (author of I Wish You More) illuminates Uni's not-so-fantastical dream and celebrates the sparkle of believing. Uni the unicorn is told there's no such thing as little girls But no matter what the grown-up unicorns say, Uni believes that little girls are REAL. Somewhere there must be a smart, strong, wonderful, magical little girl waiting to be best friends. In fact, far away (but not too far away), a real little girl believes there is a unicorn waiting for her, too. This magical story of friendship reminds believers and nonbelievers alike that sometimes wishes really can come true.